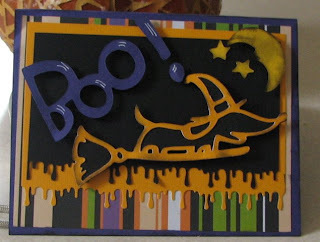 Had to try out that Drippy Goo punch and post a card on Snowmanlover's Halloween Thread Challenge.. here's what I came up with. I did add some bling. A bit of stickles on the hat and on the moon, but I didn't retake the photo, as usual... afterall, even a dog has to have her bling!